This saturday night will be Ted Richards 200th... Very good career so far. woodublieve12 wrote: This saturday night will be Ted Richards 200th... Very good career so far. He's done very well. I didnt see him playing 100 when he moved from the bombers. helicopterking wrote: Flaggies will choke. Always have. Sydney Swans defender Ted Richards says his 200th game for the club will be particularly special this weekend given the importance of the clash with Port Adelaide at Adelaide Oval on Saturday night. Richards managed just 33 games in five seasons at Essendon before making a move to the Swans for the 2006 season. He has been a mainstay in the Swans defence ever since, becoming a 2012 All Australian and premiership player. Richards said the Power supporters would help make the milestone match a memorable occasion. "I think it's one of the most exciting venues to play at, the atmosphere that Port fans create in that stadium is one of the best," Richards said. "It's one of the loudest stadiums in Australia." PORT Adelaide is again the AFL’s turnover kamikazes. And the Power will have to turn over the history books if it is to turn around the 0-2 win-loss count left by its collapse under pressure to Sydney at Adelaide Oval. No team has rebounded from a 0-2 start to win the AFL flag since North Melbourne in 1999. The Power has twice in its 19-season AFL journey dropped the first two games of a season and found its way to the preliminary finals — in 2002 and 2003 when it suffered from the “chokers” tag. The Power — as highlighted in the 48-point loss to the Swans — is cursed by a return of those game-breaking turnovers that sank the club in a mire after 2007. Coach Ken Hinkley’s demand for his team to play “brave” football that takes the game on is being undermined by a group of players who stumble into high-risk football under intense pressure. Hinkley’s review will highlight an abundance of dumb turnovers that gave Sydney too many match-defining goals. The game breaker is in the 20th minute of the third term when 20 metres from the Sydney goal, as a Swans’ kick to the goalfront bounced between Power defenders, Tom Jonas pushed a backwards handpass to teammate Jasper Pittard. It never made it. Sydney co-captain Jarrad McVeigh intercepted, kicked Sydney’s 11th goal after a 12-minute dry patch and the 36-point margin closed the contest. It was a game played consistently on Sydney’s terms. And, as Hinkley had warned, it was won with the trademark Sydney team ethos and the Swans’ incredible habit of intense man-on-man football that turned Adelaide Oval into a pressure chamber in which too many Power players suffocated. It wasn’t that none of the Power guns — in particular, captain Travis Boak and fellow midfielders Robbie Gray — failed to impose themselves on the game. So while the big hopes of the new-look Power attack with Essendon recruit Paddy Ryder and the long-standing tandem of Jay Schulz and Justin Westhoff faded against supply built on short kicks in crowded space, Sydney thrived off not only its own daring midfielders such as Josh Kennedy but the gifts presented by Port Adelaide’s turnovers. The Power’s match-up for its key defenders did not dramatically change with Sydney’s decision to put Brownlow Medallist Adam Goodes in the substitute’s seat on the bench. Franklin was marked at the start by 41-game Jack Hombsch, a sign of the faith he holds from Hinkley. This left Jackson Trengove to match-up with Kurt Tippett when the former Crow was not in ruck action. Alipate Carlile was with Dean Towers. As keen as Hombsch was for the battle, Franklin does take some beating. One-on-one or against team defence, the far-roaming “Buddy” is imposing. And he thrived off half chances, as highlighted by his soccer-style goal in the ninth minute of the last term when he kicked the ball off the ground near the boundary in the south-east pocket. Port’s start to premiership season has tested how it measures up for lessons learned and carried from last year’s AFL final series as it has opened (and lost) to semi-finalist Fremantle and grand finalist Sydney. And this week, the Power retro-tour of September 2014 brings forward preliminary finalist North Melbourne at Etihad Stadium on Saturday. Port Adelaide: Gray, Ebert, Wines, Pittard, Ryder. Sydney: Kennedy, Jack, Parker, Hannebery, Franklin, Pyke, Bird. Thats surely a token best for Ryder! This is surely the most important Sydney derby since the first meeting between the Sydney Swans and Greater Western Sydney. Both sides are undefeated, and the competition's newest club will be hell-bent on upstaging the Swans, who will be on the SCG for the first time this season. The Giants' tackling ferocity turned their match against the Demons in Canberra last week, and while the Swans looked shaky in round one, they bounced back to their best against Port on the road. With bragging rights on offer, this one should draw a bumper crowd. 1. Shane Mumford starred against his former team, earning the three Brownlow votes in the Giants' upset win over the Swans in round one, 2014. Jeremy Cameron and Jon Patton kicked seven goals between them. In round 15 at the SCG, Lance Franklin kicked five goals in the swans win and Josh Kennedy was best on ground with 29 possessions and two goals. 2. The Swans have been the number one contested possession side in the first two weeks, averaging 161 per game, while GWS has struggled in this area, ranked 14th with 129.5 per game. 3. There haven't been too many close contests between the sides; the average margin is 66 points. The Swans' average score is 113 points and the Giants' just 58. 4. The Swans have an impressive record at the SCG, winning seven of eight games last season. They've won 14 of 17 since the start of 2013. The Giants have played twice at the SCG for two losses by a combined 175 points. 5. Despite being 2-0 this season, the Swans have struggled to mark the ball inside 50, with only eight in total so far. The Giants have been impressive in this area with a total of 19 at 9.5 per game. 6. Giants midfielder Ryan Griffen is the highest ranked player at seventh on the list, with Swans Lance Franklin (8) and teammate Josh Kennedy (10) also inside the top ten. Adam Goodes. The champ started as the sub against Port Adelaide last week, and given Swans coach John Longmire said he'd picked his best side, the dual Brownlow medallist could be in trouble. The Swans have never been afraid to upset one of their favourite sons – just ask Ryan O'Keefe – so it looks like Goodes faces a battle to keep his spot. With the team wanting all 22 players to be tackling machines, the veteran might be considered a weak link. 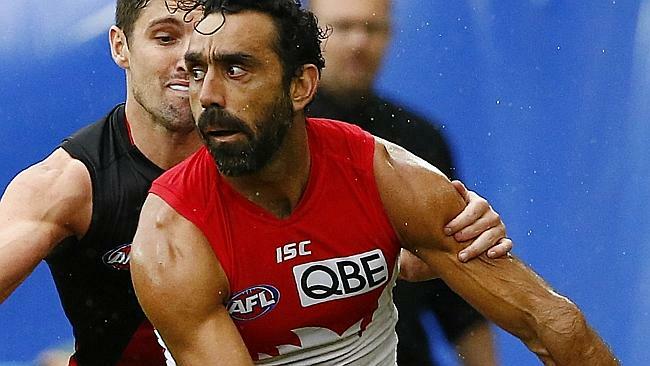 Goodes doesn't need to be a star, he just needs to show he can compete and play a role. Jim05 wrote: Thats surely a token best for Ryder! You think the Giants have improved that much to be seven points near us? I agree they've improved out of sight but the fact they beat us last season will be a factor enough for us to avenge last year's result. After last week's good result against Port, I anticipate we'll be too strong for the Giants. I think you will find that is the AFL website's prediction rather than WUB there, Rooster. HOGG Shield 2015 Division I Premiers. HOGG Shield 2017 Premier League Premiers. 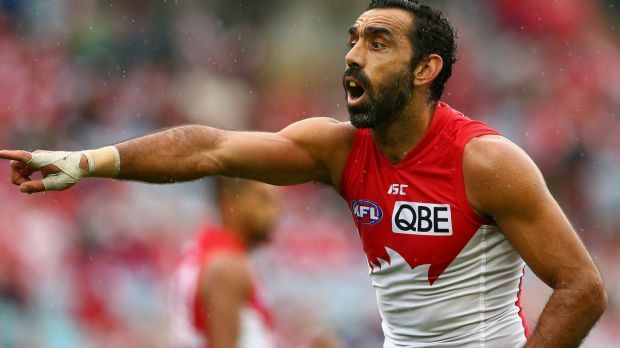 CHAMPION utility Adam Goodes will be dropped from the Sydney Swans side to take on Greater Western Sydney on Saturday. Swans coach John Longmire confirmed the news when he spoke to media on Thursday, declaring the dual Brownlow Medal winner would be relegated to the reserves this week. Longmire revealed Goodes would have been selected as his team’s sub again on Saturday but it was instead decided playing a full game in the NEAFL would better benefit the two-time premiership winner. “I suggested he start as the sub and he suggested he play in the reserves and get some quality game time and fitness,” Longmire said. Goodes has had a quiet start to the season - starting as the sub in last Saturday night’s victory over Port Adelaide where he managed just six disposals when activated in the final quarter of the 48-point win. Very brave call by Horse to drop Goodesey. I will admit he has been very quiet the first few weeks of the season. valleys07 wrote: I think you will find that is the AFL website's prediction rather than WUB there, Rooster. The people doing the write up's on the AFL's website have no idea. GWS have improved but not that much. could this be the end of Goodes' career? Maybe time to admit he should have retired at the end of last season? AFL website isn't ever over-critical either. Even if they thought it was going to be 70 points i doubt they would ever write that. bennymacca wrote: could this be the end of Goodes' career? i don't think so... i think people are looking far to much into last week... He would have known he would have been used as a sub this year when needed. Pretty bloody handy one at that. edit - didn't see the above post prior to posting my comment. he'll get back in. to good not too. Swans star Adam Goodes will be omitted from the Swans side to play Greater Western Sydney on Saturday at the Sydney Cricket Ground and will play in the reserves. Swans coach John Longmire said the 353-game star requested a full game in the back-up team after being told he would again miss selection in the starting line up. Goodes, a two-time winner of the Brownlow Medal, was named as substitute for last weekend's match against Port Adelaide and only came on late in the match. "We had a discussion yesterday about playing his sub again this weekend and he suggested he might be better off playing reserves rather than playing sub again to get some match fitness and to make sure that he's able to get some good quality game time under his belt," Longmire said. "He's obviously a champion of the game and feels as though he needs some match fitness and some form in the reserves. "We want him to keep going and he's keen to keep going. As we sit here at the moment we think he's still got a valuable role to play. He finished the season off last year pretty strongly and we're only at round three, there's a lot of football to go. We know that things can change really quickly as far as injury and form. "He is a champion of the game and we feel as though he needs to get some match fitness in the reserves instead of playing sub." "Adam is very much team orientated and wants to do whatever role the team wants him to play." Longmire said Goodes will still be an important player for the Swans this season. "We still think he can play as a sub this year and play in our best 21 this year." So who decided where he was playing, Longmire or Goodes? Player telling the coach where to play him is interesting. Booney wrote: So who decided where he was playing, Longmire or Goodes? "Oh, that's not my department. I'll just transfer you to someone who cares less than me"
Two good games in one night and crossing over each other! If only we didn’t have such a blockbuster taking up the Friday night slot. Still, that’s two solid reasons to get out of your sister’s wedding. Sydney showed they can travel when they squeezed the life out of Port in round two but this is something else. Fremantle are currently at another level and unlike Sydney they don’t have to travel. Another bonus is they only had to play one quarter last week before using the rest of the game as a warm down. The Swans won’t die wondering but the Fremantle midfield won’t go to pieces like Port’s did. The Dockers to win this one.